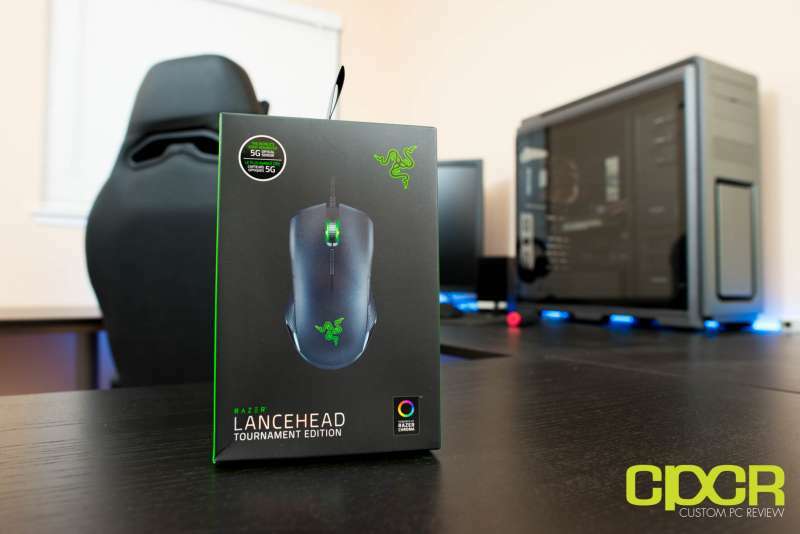 To address this market, Razer recently launched the Lancehead Tournament Edition, which we’ll be reviewing today. The Razer Lancehead TE is a premium gaming mouse designed for enthusiast gamers or eSports professionals. 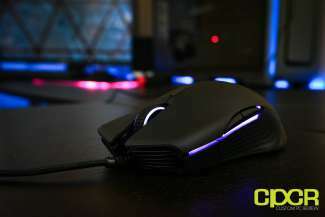 Unique about the Lancehead TE is that it features a hybrid mouse profile system as profiles may be stored either in Razer’s Cloud via the Synapse software or via internal built in memory. 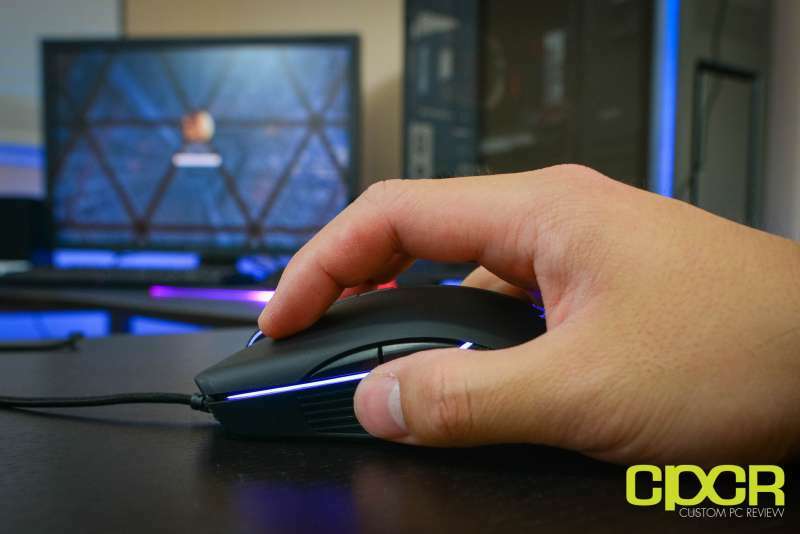 This will allow eSports players or gamers who frequently visit LAN cafes to use profiles on their gaming mice even if the Razer Synapse software isn’t available. Specification-wise, the Razer Lancehead TE checks all the right boxes. 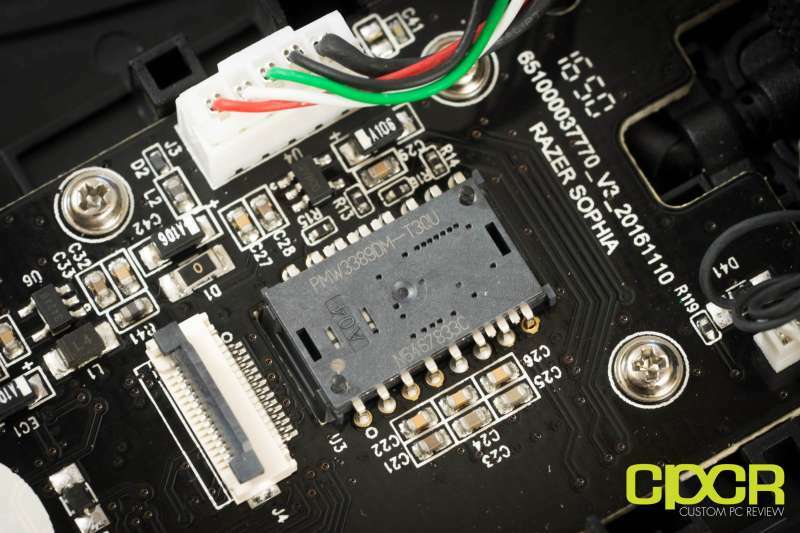 The Razer 5G Optical Sensor is Razer’s exclusive PMW 3389 sensor which we’ve seen in the excellent Razer DeathAdder Elite. 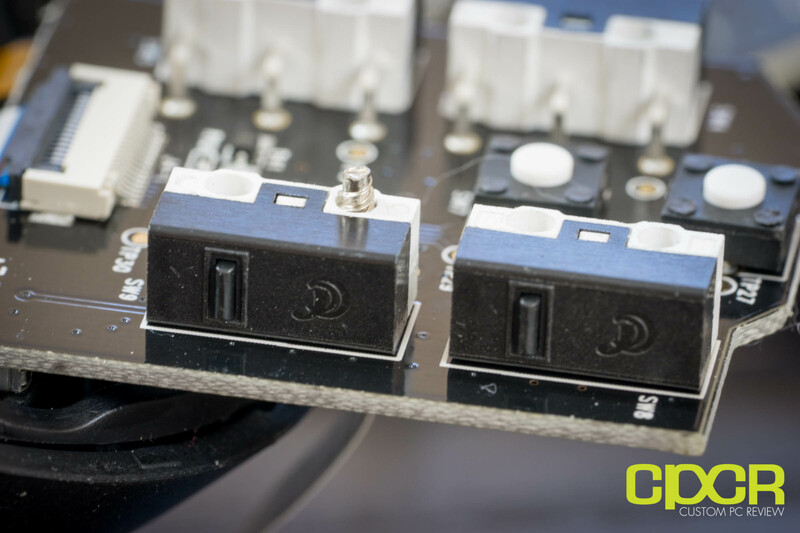 Switches onboard are now upgraded to the Razer designed Omron manufactured 50 million click switches which are the gold standard in the industry. Let’s go ahead and take a closer look. 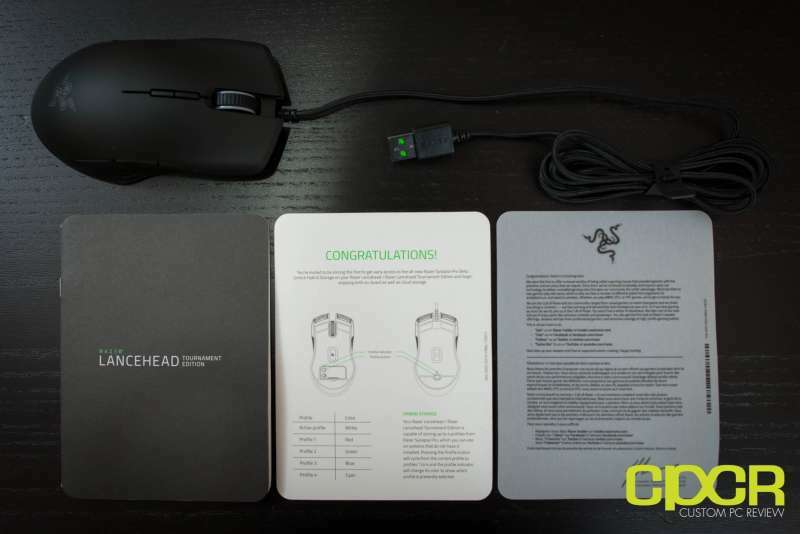 Here’s a look at the packaging for the Razer Lancehead TE. Inside the box is some documentation along with the Razer Lancehead TE. Here’s a look at the Razer Lancehead TE. Physically, the Lancehead TE features an ambidextrous design with two slightly recessed buttons on each side. 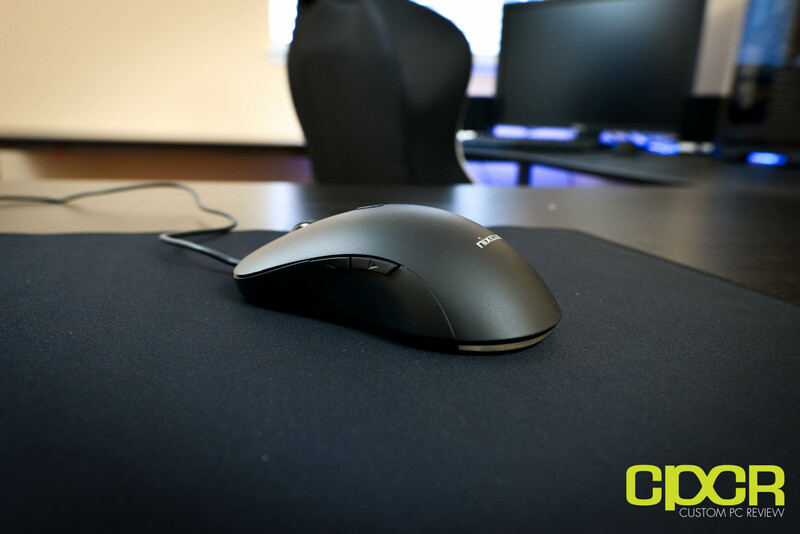 The sides of the mouse are also coated with additional textured rubber material to improve grip. 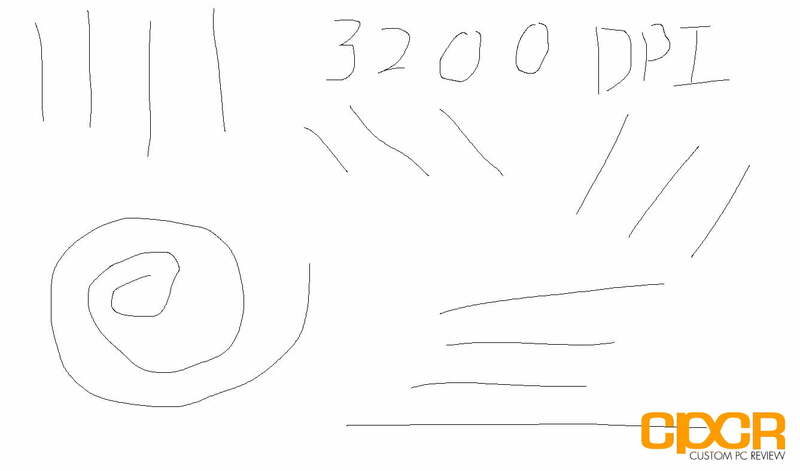 At the bottom of the mouse are five Teflon feet, which aren’t massive, but provide the mouse with smooth movement. 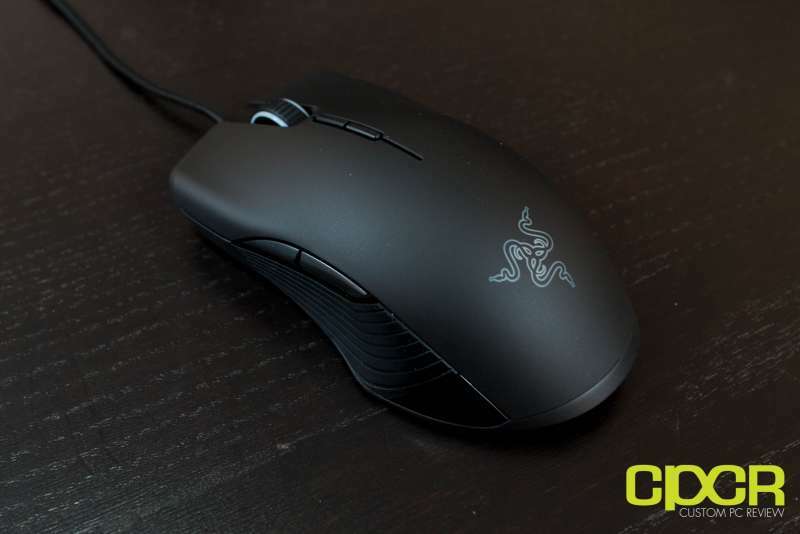 The Razer Lancehead TE is a slightly heavier wired mouse weighing in at 106g. Of course, nothing screams real gamer than RGB lighting these days and Razer has done a phenomenal job at bling-ing up the Lancehead TE. Not only does the mouse feature beautiful lighting on the scrollwheel and the logo, but Razer has taken styling cues from the Diamondback’s playbook and has bling’ed up the sides of the mouse as well. In the hand, the mouse is fairly comfortable. 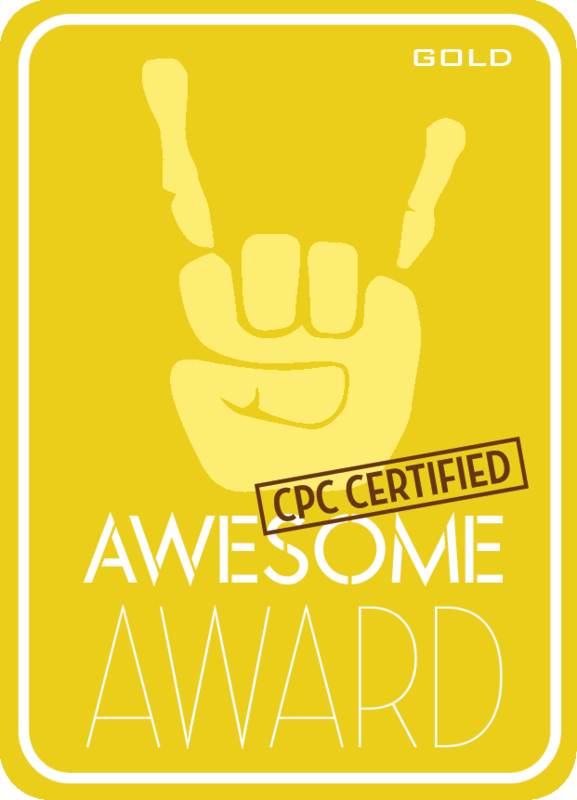 It’s ideally suited for those using a claw style grip. 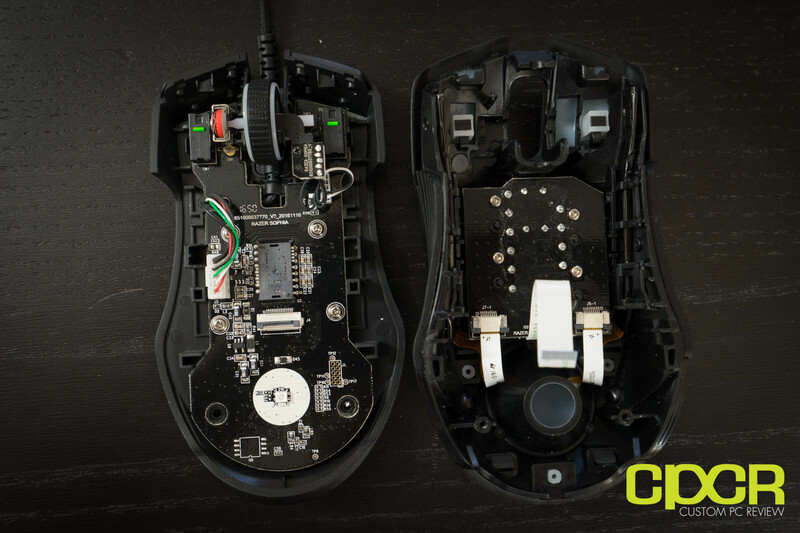 Opening up the Razer Lancehead TE, here’s a look at the internals of the mouse. 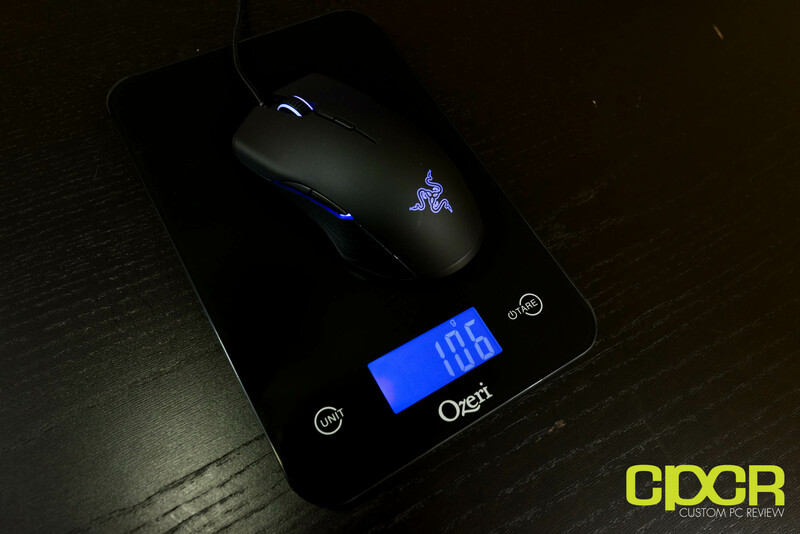 The sensor onboard is the Razer 5G Optical, or PMW3389DM-T3QU, capable of up to 16,000 DPI. 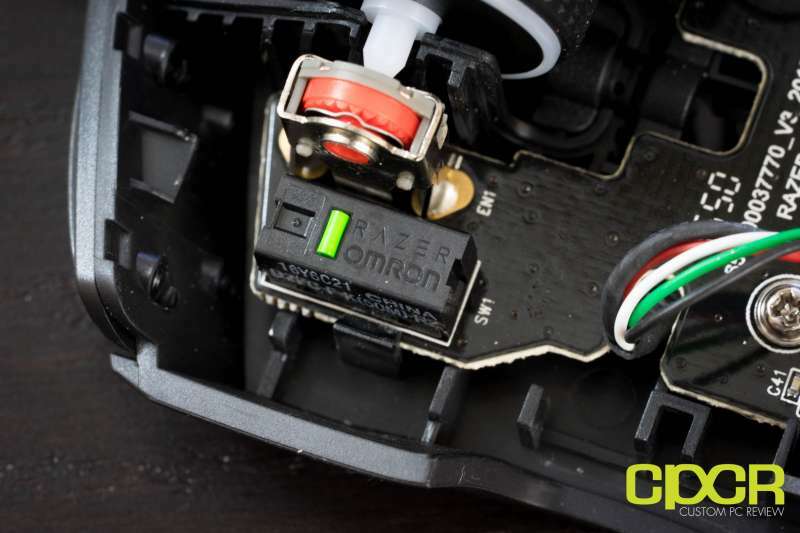 Here’s a look at the Razer/Omron 50 million click switches. 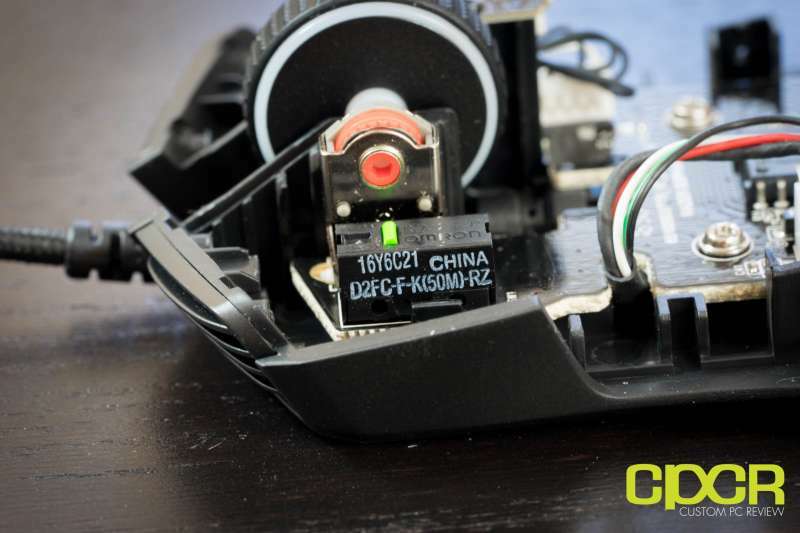 The switches are manufactured in China and are marked with a part number of D2FC-F-K(50M)-RZ. 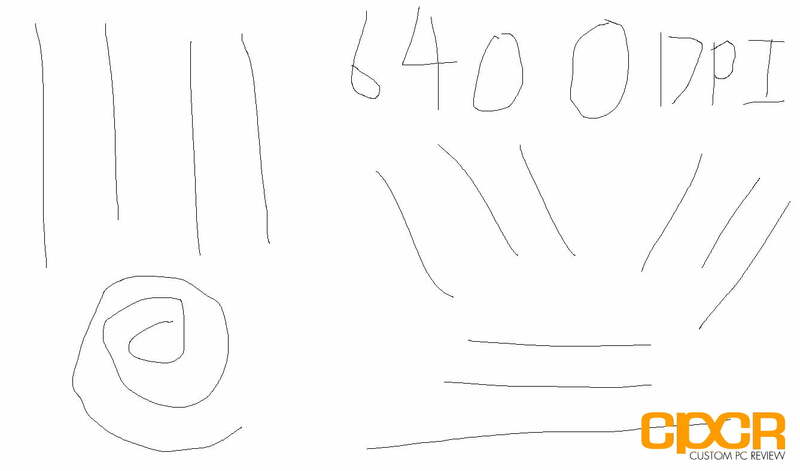 Here’s a look at the side buttons. The switches are a Chinese brand whose name literally translates into long wind (长风). The switches are a bit stiffer and clickier than the Omrons used in the main switches. 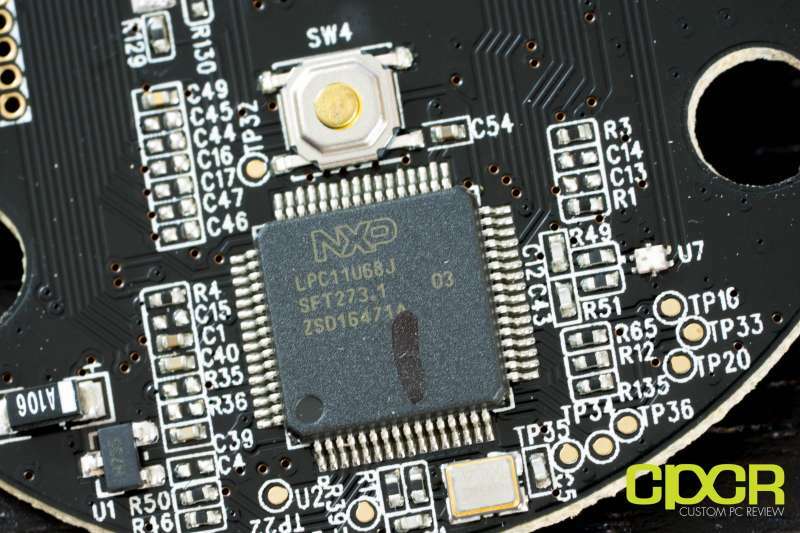 Mounted to the PCB is also the NXP LPC11U68J 32-bit ARM Cortex-M0 processor. 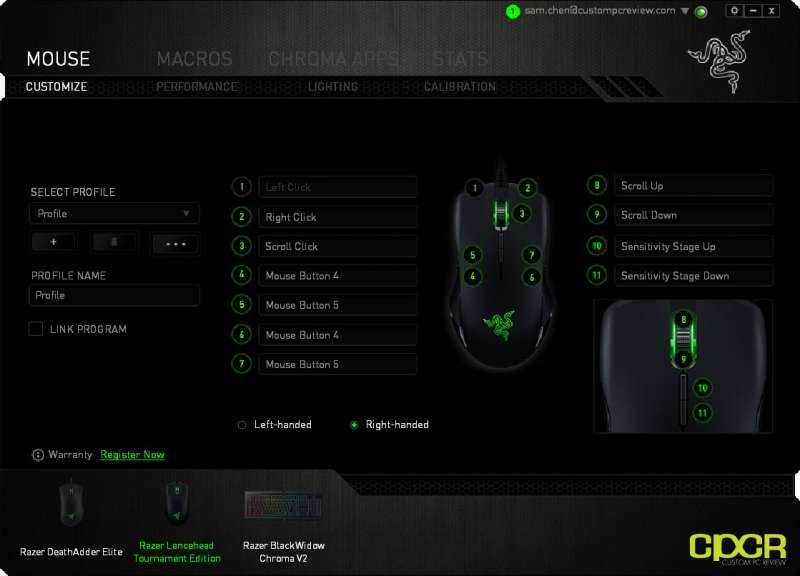 The Razer Lancehead TE is designed to be used with Razer’s upcoming Synapse 3.0 software however, the software is still under development at this time leaving us with just Razer’s current 2.0 version of software. As we’re pretty familiar with Razer’s Synapse software, we won’t be going into too much detail here as we’ve covered the software in numerous reviews. For those completely new to Razer’s software ecosystem, Razer’s Synapse is about as good as gaming peripheral software packages go. 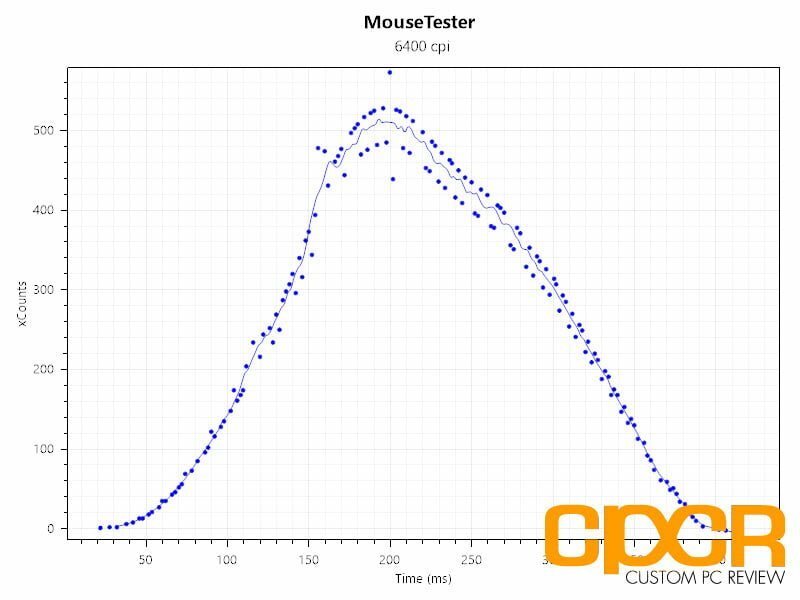 In addition to setting profiles and adjusting sensitivity, the software allows for changing the lighting options, setting macros, adjusting liftoff distance, calibrating the mouse with the mousepad and more. Arguably, the most important part of any gaming mouse’s software suite is its sensitivity adjustment options. 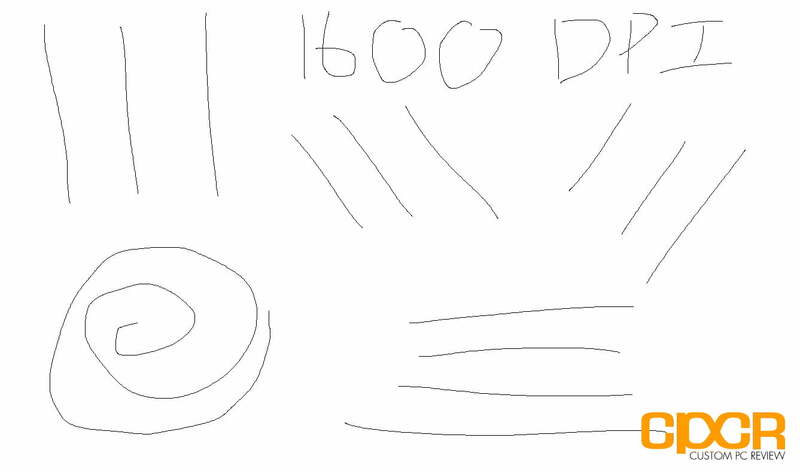 Here we can see that Razer’s suite allows for a wide range of customization from 100DPI to 16,000 DPI in 100DPI increments. Interestingly enough, Razer also allows the independent adjustment of DPI for the X and Y axis. Why would anyone do that? I’m not quite sure, but that’s some serious level of customization. 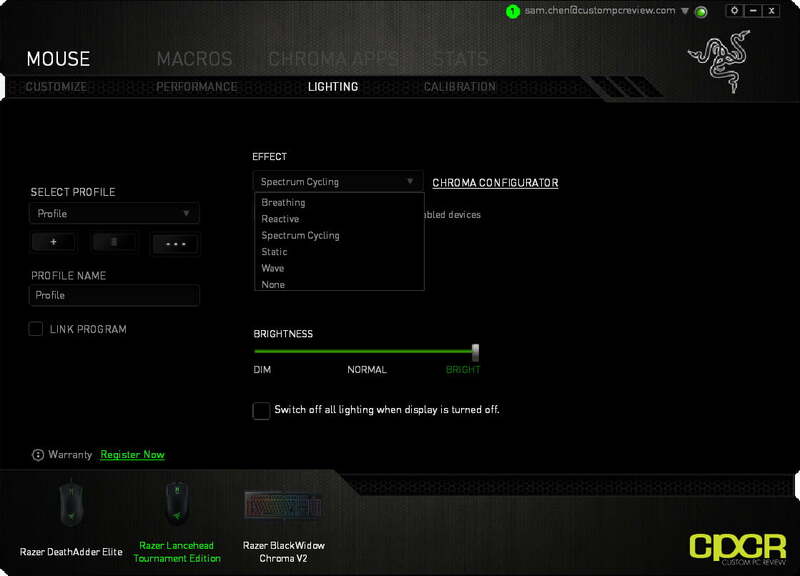 In the lighting tab, Razer offers the usual Chroma RGB lighting effects such as breathing, reactive, spectrum cycling, static and wave. Nothing too special here. 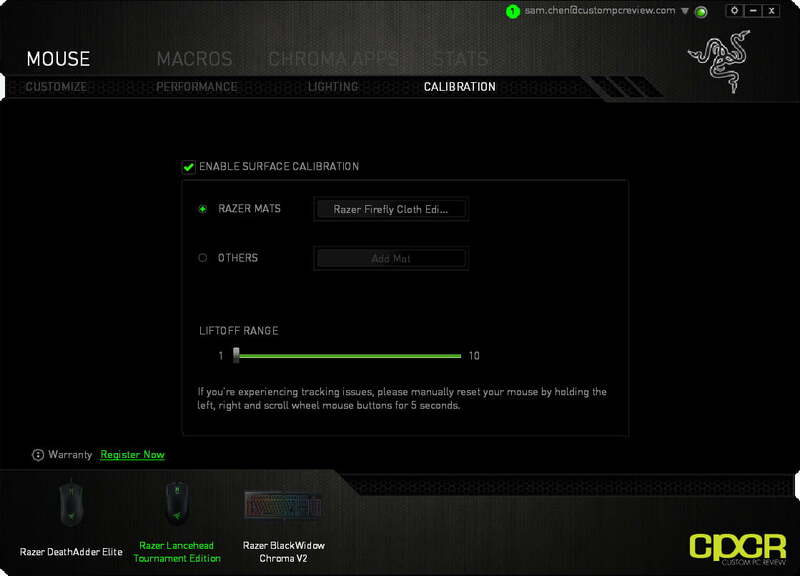 Razer also offers the ability to calibrate the mouse against the mousepad you’ll be using it with. This allows for the best compatibility and tracking performance on any type of surface. 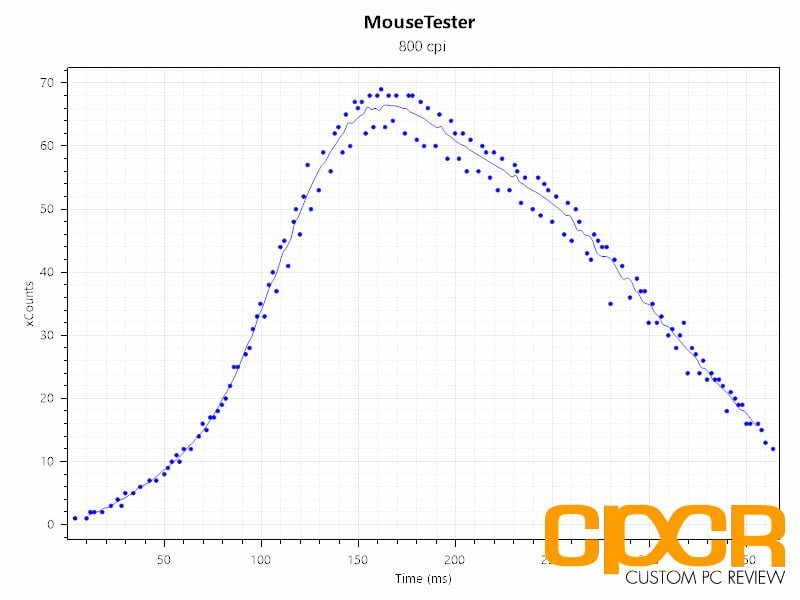 I’ve spent the past two weeks testing the Razer Lancehead TE in numerous FPS games and have found no significant issues with the mouse. 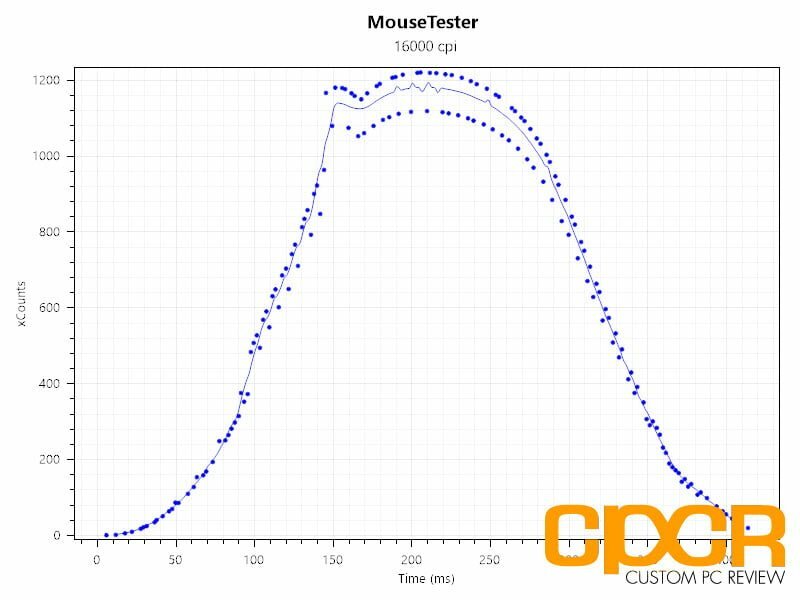 The sensor performance here is excellent with little to no smoothing or acceleration detected. 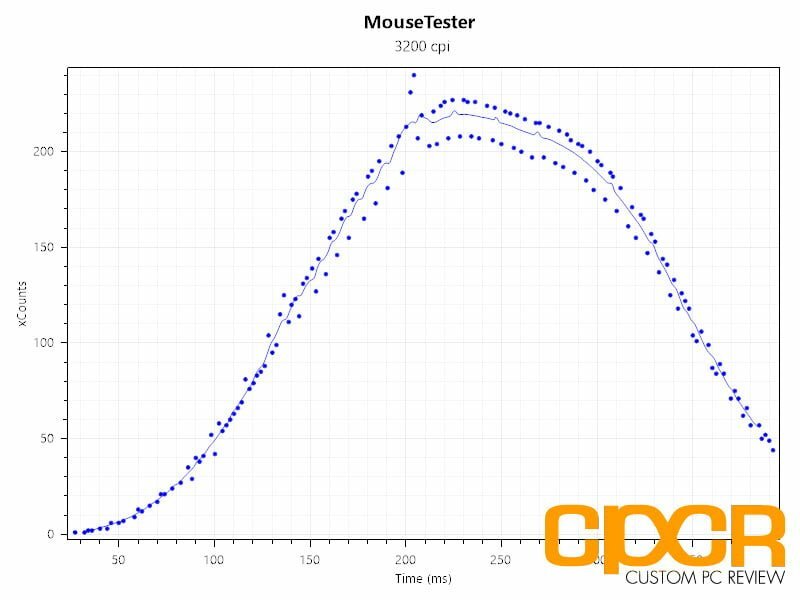 This is consistent with my previous experience with the Razer DeathAdder Elite which utilizes the same sensor as the Lancehead TE. 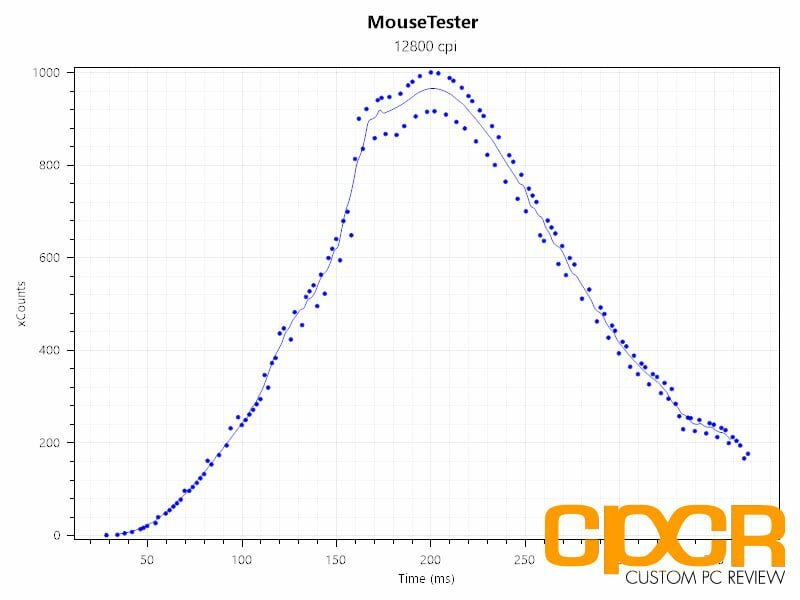 Here’s a look at count/time results from Mousetester 1.5.3 when quickly swiping to the right at different sensitivity stages at 1000Hz polling rate. 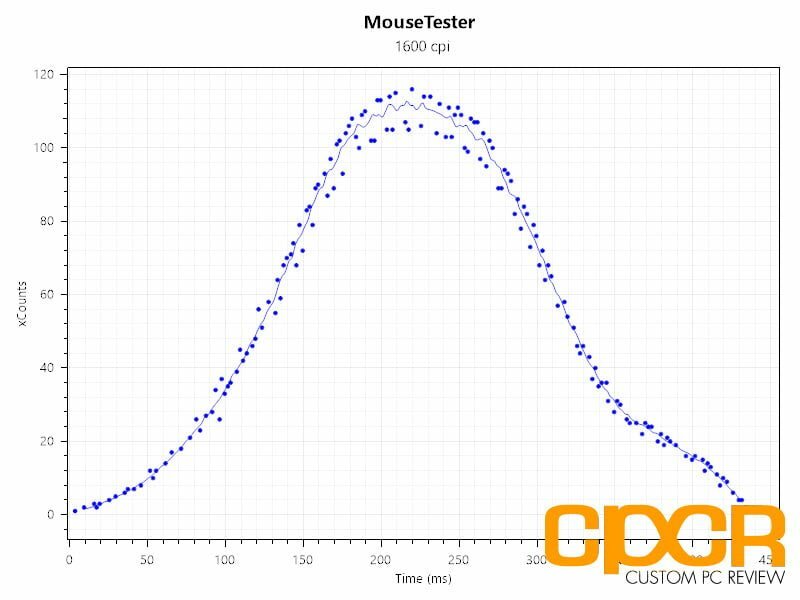 Razer’s 5G Optical Sensor performed well here with no loss of tracking. 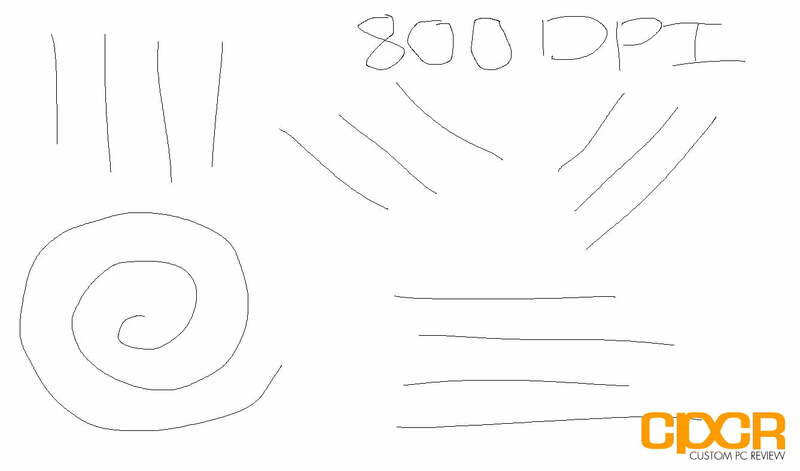 Here are a few shapes I drew at different sensitivity stages to test for any jitter, prediction, angle snapping, drift control, etc. 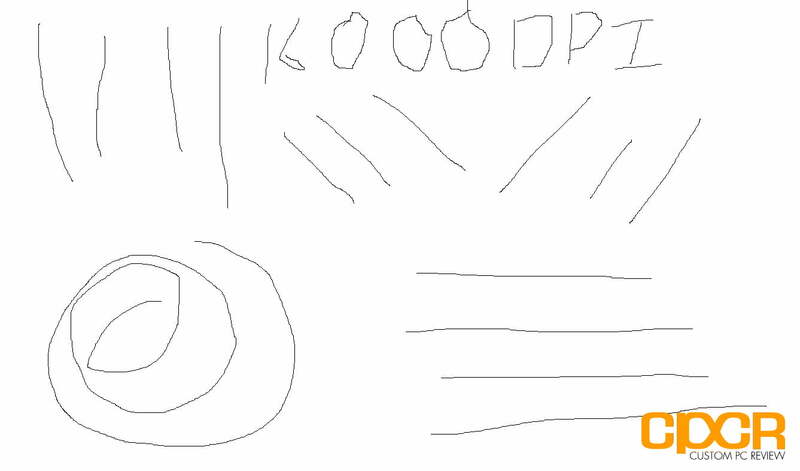 No major problems here to report as well other than the fact that I’m terrible at drawing on a PC. Razer’s 5G Optical Sensor (PMW 3389) is about as good as mouse sensors can get. Over the years Razer has proven time and time again that they’ve mastered the art of the gaming mouse and the Lancehead TE is an excellent example. 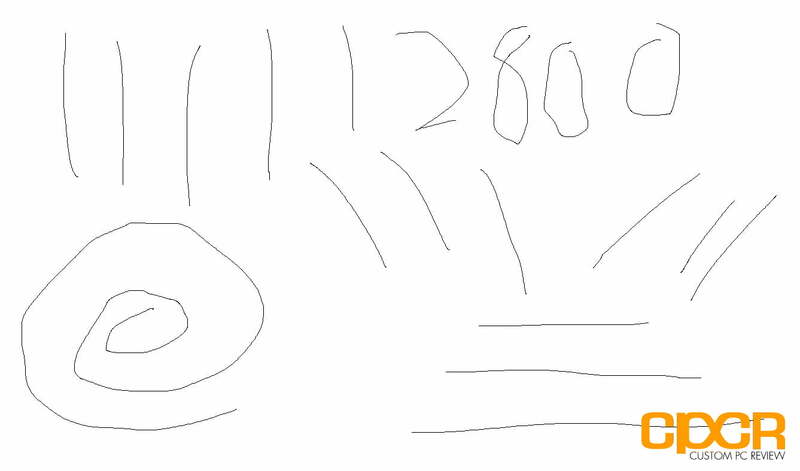 While I myself prefer the more comfortable feel of the DeathAdder Elite, the Lancehead TE is an excellent gaming mouse for fans of ambidextrous designs packing solid build quality, a flawless optical sensor, quality Omron switches, and beautiful RGB backlighting. As far as issues, there wasn’t anything significant to report during testing however, I’m not sure how to feel about the fact that Razer is launching their new mouse before a big portion of the advertised features are even available. While on one hand I’m glad that Razer is addressing a major need from gamers who want a top notch ambidextrous gaming mouse, on the other hand I’m not so sure I like the fact that Razer launched a mouse that isn’t completely functional yet, requiring a software that doesn’t even have a defined launch date. That said, I’m glad Razer is spending more time getting things right than haphazardly shipping broken software which sadly is something far too many companies are perfectly fine doing. The Razer Lancehead TE is currently priced at $79.99 which is on the higher end of the price spectrum compared to most wired gaming mice these days. That said, if you’re looking for a premium, wired, RGB backlit, ambidextrous with a top notch optical sensor, the Lancehead TE has surprisingly little competition espeically for those already hooked into the Razer ecosystem. Highly recommended!